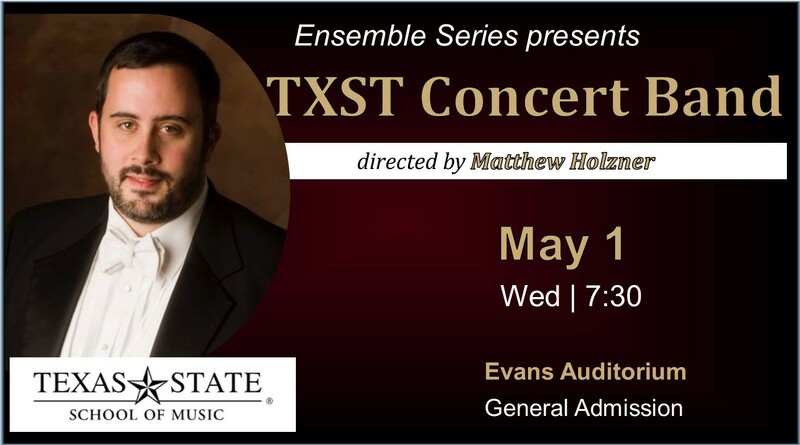 Join the Texas State Concert Band, under the direction of Matthew Holzner, as they present their final concert for the Spring Semester. plus $2 Texas State Presents processing fee for tickets online or at the window. BOX OFFICE OPENS 30 MINUTES BEFORE THE PERFORMANCE. SEATING BEGINS BY 15 MINUTES BEFORE THE PERFORMANCE. THIS IS A MAROON EVENT.